Lately I’ve been on a Pathfinder kick, but have done a lot of D&D gaming in the past. I’m currently hosting a campaign at my house, so I’ve also been kicking this idea around. The pic of your design is rather small and near impossible for me to read. 1) Not sure if you need maple ply. Most of that is just a thin maple veneer over regular ol’ plywood. It won’t give you any added strength or warp resistance. Any cabinet grade plywood should work. Stay away from cheap, home store plywood. That will probably be warped sitting there on the rack. You may want to source your plywood from a hardwood lumber dealer. Baltic Birch plywood is also a favorite for jig makers as it tends to stay pretty flat. Use maple ply for any areas that will be seen, to match the rest of the table. But for the felt covered area, you can use something cheaper. Also, if the edges of the ply is going to be seen, get some maple edge banding. 2) I’m not sure what that would be called either. I think you will need to experiment with angles. Build the table and make a stand for the tablet (there are plenty of options here in lumberjocks – just do a search). That way you can figure out the best position and angle for you without permanently cutting into the tabletop. 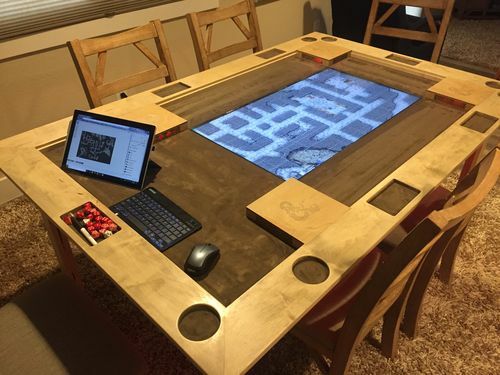 At that point, I would build a separate tray to hold the tablet, cut a rectangle into the plywood and drop the tray into the tabletop. That would probably look the nicest and be easiest to build. 3) I guess this would depend on your routing skills. Routing would probably be the best option, as long as you can make it look nice. Is 1/2” deep enough? Maybe I just get excited when I get into combat, but my dice tend to bounce a lot. Also, if you intend to use the table for anything other than gaming, you will have these recesses permanently in the table top. 4) Will you be laying the TV on the playing surface or will it be recessed in? 3/4” plywood would be plenty strong enough to hold a 20lb TV. But recessing it will probably require additional supports under the table. However, I tend to over-engineer everything. So put me in the “more-supports-the-better” camp. But if the supports are not going to be seen, I’d use the cheap, warped plywood from the home store. Or solid pine, or poplar, or off-cuts from the other parts of your table. As soon as you start talking plywood, I assume you are not making heirloom quality furniture that you’d expect to be treasured in a century. Go as cheap as you can for the non-visible stuff. 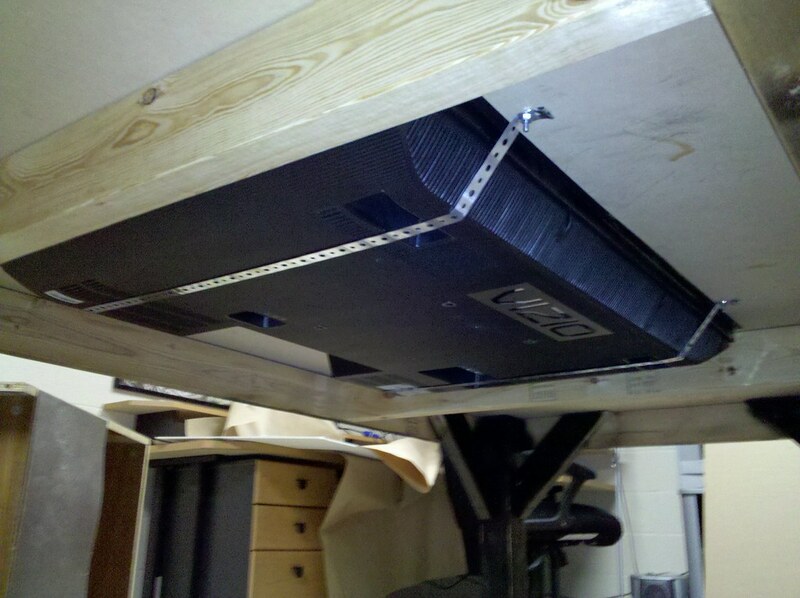 No one is going to climb under your table to see if the plywood you use for support has voids in it or not. First, thanks for taking the time to respond! Much appreciated. When I attached the image, it shrank it. Here’s a copy on my google drive: https://drive.google.com/file/d/1FlLnO8qT7rS2isCnTMgNg8KoAY2lkjI2/view?usp=sharing, it should be full size. 1) I found a local hardwood shop, but feel like a bit of a tool as I don’t know all the vernacular yet. Their product list shows birch plywood, but doesn’t specifically call out Baltic…if they didn’t have baltic, would another birch work? or do I simply ask them for cabinet grade plywood? What I don’t want them to do is give me the noob wood because they don’t think I know what I’m doing…Not saying they are shady, but I like to be an informed buyer. 2) Thanks, I was thinking along those lines but wasn’t sure. 3) So the tray is not for rolling, it’s for holding their dice, pencils, etc. The rolling will be done in the space between the tv and the rail, it’s about 6 3/4” and the tv will have plexi on top to protect it. I’ve been reading up on routing and I’ve done basic routing before, but mainly for finishing work, never something like this. You bring up a good point on the second part, using the table for something else. I’ll get to that at the end as that should probably be it’s own topic. 4) It’ll be recessed in so that the plexis is level with the felt. I’m thinking I’ll just extend the 22” side of the ‘box’ to hit both sides, that should be enough. I’m not talking heirloom quality, but I want it to last and look really nice. I host other things like board meetings, parties, etc and would like it to not ‘detract’ from the room. You’re right about underneath, but I want to ensure that whatever is underneath doesn’t warp or cause problems for what is on top. 5) As for using this table for other things. I will need to have a conventional table. I don’t want the dice or the cup holders to show, so doing an insert that you pull out (like I have now) isn’t, in my opinion, the way I want to go. I was thinking, and would love your opinion, about creating an overlay. The game table will be 60×46. if I have a piece of maple ply that is 60 1/2×46 1/2, then I could lay it on top. For the edges of the ply, I would put a border of 3/4×1 3/4 maple. that hangs down to cover the rails and secure it to the table. The reasoning is this: the extra 1/2” allows me to put 1/4” felt padding on the inside sides of the overlay border, the 1/4 extra on the border allows me to put 1/4” felt padding on the underside of the overlay. This should provide nice protection to the underlying table. The 1 3/4 borders are enough to secure it in place and hide the rails (having two 3/4 pieces stacked would look awkward, and I’m not sure I want to do a small reveal/stepped look). I want the sides to completely cover the ‘rail’ and if I do that, then I can use swivel levers to swing under the rail arm and really secure the top to the table to prevent any wobbles (main reason for doing that would be to prevent warping of the overlay, I wouldn’t put the swivels on unless it didn’t lay totally flat). Thoughts? Thanks again for your input…also, 5e is a lot of fun, we switched from pathfinder about 6mos ago and are loving it. They really got 5e right this time. This sounds like a fun build. Wish I had the room and budget to do it myself. All of that is to say, yeah. It should work well for your needs. For routing trays, make a template and use a flush cutting bit with a bearing. Also practice on scrap a couple of times. No sharp corners, or radii smaller than your router bit, otherwise you will need to pull out the chisels to clean up where the router couldn’t get. You may want to add a larger, plexi glass bottom to the router so it is less likely to tip in the trays. 4) Apparently, the TV doesn’t need too much bracing. I found a couple places online doing something very similar to what you want to do. This guy is doing it with just some steel straps and bolts (single pic of interest). And this guy just used a pocket holed board to hold his TV in place (single pic of bracing). Notice though, how they both have cross bracing from side to side right next to the TVs. That can be the cheap wood. 5) That sounds like a totally feasible plan. Another option is to use the dice trays and drink holders as indexers to hold the top in place. Cut some pieces of 3/4” plywood to fit the cutouts set them in the trays, put some hot glue on each one and rest the table top on them. That will give you 1/4” clearance between the bottom of the nice table top and the top of the game table. The topper won’t be able to slide around due to the trays holding them in place. And they’d be pretty light and easy to store. I was in a 5e game for a minute a while back. Then scheduling conflicts, relocations, and an unprepared GM made the whole thing fall apart about 500XP from level 3. It was a shame. I had great plans for my wizard, but wizards are near useless at low levels. I never got to play him in his full glory. Awesome, thanks again for the advice. Those cabs you made look sweet, gives me an idea for a future project for board game storage…. That metal strap idea for the TV is intriguing…I’ll have to think about that some, but am still leaning to boxing it in like that second pic. One thing to consider is to find a table that is about the right size and cut a hole out of it with a jigsaw for the TV monitor. If you cut the hole slightly smaller than final size, you can use a pattern bit with a straight edge get a nice clean edge. This will save you the learning curve on building a table. You may be able to find an appropriate table on Craig’s List for considerably less than the cost of materials to build it yourself. 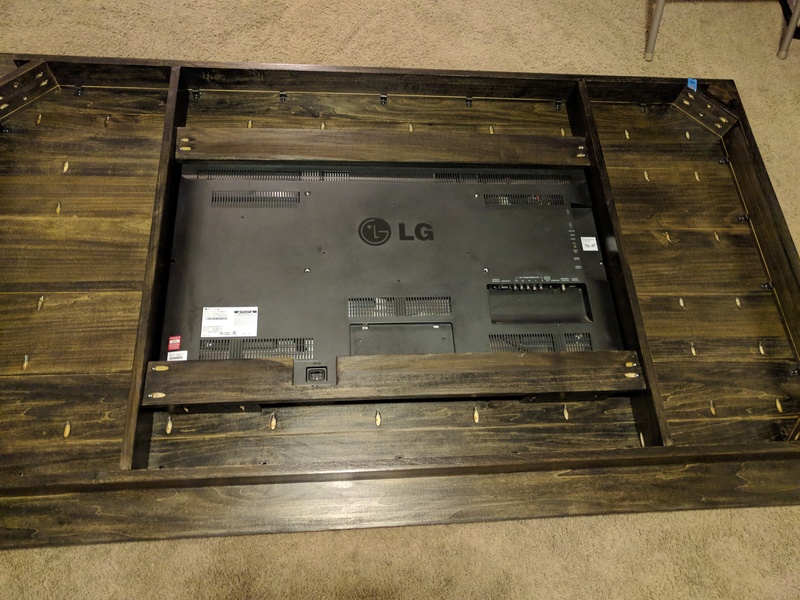 You can then just build a box or a support to attach to the bottom of the table hold the TV and attach a strip around the rim to hold the glass over the monitor. BTW, make sure that the TV monitor can be viewed from all angles. Some of the older ones might have good angles from the sides but might not in the up and down angles. You could also simply modify your existing table by replacing the existing glass with a new top. For routing the dice trays, I would use a box core bit with bearing guide (like this) and template. If the cup holders are just a recess and not cut all the way through, you can probably use the box core bit with a template for this as well. The box core bit will leave nice rounded corners in the bottom. Note that if you buy and modify an existing table, the top will very likely be made with veneered MDF or particle board so you will want to line the dice trays with felt. You could perhaps use a similar approach to make a recess for the tablet and simply buy a table case with a built in support to hold it at an appropriate angle. Or simply cut another hole all the way through the top and attach another box to sit the tablet and case in. Thanks, much appreciated. I am debating on the dice trays…if I go your route, I wouldn’t felt the bottom and they’d look nicer… if I went the route of a straight edge router, I could do felt easier, and they’d be quieter. I’ll experiment on some practice wood and see. I wish I had something like this, but our Pathfinder party is more than 5 people. Nor do I have the space for something like this. But I am very envious. Woah…I’m working on plans for my own right now (also need to incorporate a base that supports rack rails for the audio equipment for podcasting), and was debating putting a cheap second hand flat panel in for our map interface. But now I’ve seen yours…how could I settle for something less? Super jealous, and very cool!